Late last week Fannie and Freddie announced their full year 2015 net incomes, with Fannie reporting $11.0 billion and Freddie posting $6.4 billion. And on February 9, lawyers for Washington Federal et al filed a motion in the Federal Court of Claims—asking for a status conference to discuss contracting the timetable for the related cases pending there—which served as a reminder that this suit seeking to overturn the 2008 conservatorships, stayed during discovery in the net worth sweep actions, still is very much alive. There is a link between these events. The companies’ 2015 results heralded the third stage of their conservatorships. In the first stage, which lasted through 2011, mammoth non-cash accounting losses put on the companies’ books by FHFA forced them to draw $187 billion in senior preferred stock, which, at a dividend rate of 10 percent, required them to pay $18.7 billion per year to Treasury. During the second stage—2012 through 2014— the companies earned $183 billion when a large portion of the earlier losses reversed themselves, but because of the August 2012 net worth sweep all of those earnings went to Treasury, not the companies’ shareholders. Now, in this third stage, the non-cash entries that dominated the first two stages have waned, and Fannie and Freddie’s annual net incomes are down to levels more reflective of the fundamental earning power of their businesses. Significantly, however, their combined 2015 earnings of $17.4 billion fell short of the $18.7 billion in annual senior preferred stock dividends the companies were required to pay before the net worth sweep, and their earnings in future years likely will fall short of that amount by even more. For those who believe that some reconfigured version of Fannie and Freddie is the best alternative for the mortgage finance system going forward, the fact that their earnings have returned to levels insufficient to cover their pre-sweep dividend obligations highlights the importance of prevailing not just in the net worth sweep cases but also in the Washington Federal lawsuit. That suit challenges both key actions of the conservatorships: the takeover (“the Government’s decision…to appoint the FHFA as conservator for Fannie Mae and Freddie Mac)” and the terms (“the action by the Government…to enter into senior preferred stock agreements… with Fannie Mae and Freddie Mac”). It is well argued, and only will get stronger as it is amended for facts unearthed or brought to light through discovery in the net worth sweep cases, and as more facts emerge. Conventional wisdom is that it will be difficult to successfully challenge Treasury’s decision to take the companies over, because of the deference courts give to regulatory actions during times of crisis. But this instance should be an exception. As we have detailed elsewhere, Treasury’s decision to take Fannie and Freddie over was not a rescue, made amidst the “fog of war;” it was a well-planned and meticulously executed strategy to expropriate the assets of two shareholder-owned companies for policy purposes, including ensuring that banks and other lenders had reliable outlets for their mortgages, and buying time for Treasury to do true rescues (or “bailouts”) on an advantaged basis for the troubled institutions that it favored. Evidence of such policy calls abounds. One sequence that has not been adequately highlighted involves inconsistent actions regarding Fannie and Freddie’s capital and preferred stock. Paulson notes in his book, On the Brink, that he wanted some “good news” to give to the market prior to announcing Bear Stearns’ acquisition by JP Morgan in March 2008, so he overrode the objections of OFHEO Director Lockhart and reduced Fannie’s and Freddie’s surplus capital percentages (giving them more lending capacity) in exchange for non-binding promises by the companies to add capital. Fannie did raise $7.4 billion in two separate issues of preferred stock in May. Then, four months later, in anticipation of coming bad news from Lehman Brothers, Paulson took Fannie and Freddie over, citing their lack of capital—which exceeded regulatory standards and hadn’t been a concern for Paulson when he’d intervened to reduce their surplus capital percentages in March. Among those wiped out by this second action were purchasers of the preferred stock Fannie issued in May, at Paulson’s urging. At the time Fannie and Freddie were taken over, the serious delinquency rate on their residential mortgages was about one-third that of prime mortgage lenders, and less than one-tenth that of subprime lenders. Treasury took the companies over not because they were weak, but because they were strong. Paulson said it best himself, when he told the Financial Crisis Inquiry Commission, “[Fannie and Freddie], more than anyone, were the engine we needed to get through the problem.” Treasury needed Fannie and Freddie to help keep the financial system afloat, and it simply took them, under pretense of a rescue. That should be evident to judge Sweeney. Yet even if the takeover is not successfully challenged (and I believe it will be), its terms most certainly are vulnerable. Treasury imposed the highly punitive terms of the preferred stock purchase agreements on Fannie and Freddie only after they had been pressured into agreeing to conservatorship. In conjunction with FHFA, an agency it controlled, Treasury in these agreements gave itself warrants to purchase 79.9 percent of the companies’ common stock at a nominal price. It also invented a financial instrument unique to Fannie and Freddie—senior preferred stock that was not repayable without Treasury’s explicit permission—which enabled it to capture huge amounts of the companies’ future earnings by having FHFA run up their non-cash accounting losses and force them to pay an annual dividend of 10 percent after-tax in perpetuity to Treasury on senior preferred stock they did not need. Treasury’s justification both for giving itself the warrants and for requiring Fannie and Freddie to pay it $18.7 billion per year prior to the net worth sweep is that it took “enormous risk” in “rescuing” the companies, and it points to their $187 billion in senior preferred stock as the embodiment of that risk. But that explanation does not withstand factual scrutiny. The $187 billion in senior preferred stock Fannie and Freddie had outstanding at the end of 2011 was the consequence of $151 billion in non-cash losses put on their books by FHFA during the first stage of the conservatorships, and the $36 billion in dividends they had to pay on that stock. The irrefutable proof of the artificiality of those $151 billion in non-cash losses is the speed with which they were recouped. From the time of Fannie’s creation in 1938 and Freddie’s in 1970, their cumulative combined earnings through June 2008 totaled less than $100 billion. Yet in just 18 months, from the fourth quarter of 2012 through the first quarter of 2014, the two companies somehow came up with enough income to pay $158 billion to Treasury. How could Freddie and Fannie possibly have earned in 18 months half again as much as they’d earned in all of their respective 38 and 70 years of existence? The question answers itself. Real economic losses must be repaid with real economic income; artificial losses can be repaid by reversing the losses. Neither the large majority of the losses booked by FHFA in 2008-2011 nor the subsequent recoveries of those losses were real. But it may not even come to a judge’s ruling. Now that the facts about what Treasury did with Fannie and Freddie are out, they can’t be re-hidden. It therefore is entirely possible that officials either in the current or the coming administration will realize that the positions Treasury has taken on Fannie and Freddie are untenable, and they will change course. This course change could include their position on mortgage reform, with a realization that seeking to replace the two companies that produced the best performance records prior to the crisis with a new and untested alternative, or “private market” entities or mechanisms that did demonstrably worse, is folly. I thought it was quite good. He made one oversimplification–which I’ve pointed out to him– and that is Deloitte cannot restate Fannie’s financials; that’s the sole responsibility of the company. What Deloitte can do–and very likely should have done–is withdraw its opinion on Fannie’s post-conservatorship financial statements, which then would force the company to restate them. Thank you very much for responding with your thoughts while confirming my belief. At this point, it seems that the financial statements are etched in stone. In addition, it appears that Deloitte didn’t perform their due diligence with their audit and opinion in comparison to the forensic accounting. Is it safe to say that they might have possibly committed fraud and conspiracy? Given that Deloitte is being sued in Florida where there is a sunshine law; will we have an opportunity to see protected information (evidence) there? Lastly, we know that the SEC filed complaints against you and several other GSE executives in the past. Would you characterize that as a way for the government seeking escape goats or conspiracy to deflect and/or hide their unlawful actives? It is clear that SEC, DOJ, FHFA and Treasury are government agencies. I’m going to assume they will NOT investigate themselves. I find government conspiracy is very possible. I appreciate your time and thank you very much for responding. Please understand the context before replying. May be state courts can not compel the Federal agencies to give more information. I’d rather not speculate on whether Deloitte personnel had what lawyers call “scienter,'” which is knowledge that an action was wrong at the time it was taken. I do think they will need good answers for why they approved some of the accounting entries made post-conservatorship. I would think that if plaintiffs in the Deloitte case are just going after documents kept by Deloitte, such as their auditor’s work papers, that won’t be covered by a protective order. The SEC never actually filed a suit against me (or any other Fannie Mae executive). They did send me what is called a Wells Notice, advising me of their intent to file charges, but after my lawyers and I responded to it–giving our side of the story to counter what Fannie’s regulator, then OFHEO, was saying–no charges ever were filed. I guess Deloitte is stuck between a rock and a hard place. I like how plaintiff is going after documents kept by Deloitte that won’t be covered by a protective order. This could open up another can of worms towards the SPSPA, I think. Equally important, I’m very glad no charges were filed against you! Cheers to that! FHFA as the FnF conservator transferred the duties and rights of FnF conservator to Tsy thru SPSPA (irrespective of applicable laws and validity of SPSPA). Now FHFA as the nominal FnF conservator seeks approval of Tsy for all decisions related to FnF. Does not this arrangement make Tsy as the defacto FnF conservator and FHFA as the nominal FnF conservator ( also FHFA as an agent of Tsy) ? In this situation can FHFA the nominal FnF conservator invoke anti-injunction provisions of HERA? I’m not a lawyer, but I do not believe FHFA could, or did, transfer the “duties and rights” of the conservator to Treasury. It agreed to the PSPAs with Treasury, but that’s an entirely different matter. I also don’t know that FHFA “seeks approval of Treasury” for all decisions related to Fannie and Freddie. (If it does it certainly shouldn’t). Thanks, You are the most knowledgeable person about FnF. We appreciate your help in clarifying these complex doubts. The panic and helplessness of FHFA director as FnF conservator is very clear from recent public speech. It is confounding on why would FHFA director as FnF conservator ask for clarification (@3:30min in panel discussion, “Calling somebody to take some action to clarify the situation”),when HERA makes FHFA conservator the sole authority to decide as FnF conservator? FHFA director as FnF conservator should be the only person to clarify anything to do with FnF. When FHFA director as FnF conservator broadcasts SOS, seeking clarification from the unknown powers that are controlling the FnF situation, it is time for courts to take notice of it and act on it. Generally, there is nothing untoward about a creditor such as treasury obtaining substantial rights to consent and covenants prohibiting debtor action such as contained in PSPA, but most debtors are not subject to a statutory prohibition that it not be subject to any other agency, such as in HERA, and it so happens that FHFA borrowed from another agency (treasury), granting treasury what would normally be considered appropriate creditor controls. It remains for me an interesting question whether the PSPA violates HERA because FHFA put itself in a position of being subject to treasury, and Mr. Watt’s testimony before congress and elsewhere certainly confirms that. How normal it is for a creditor who happens to be US Gov, and the conservator who happens to be another US Gov agency to keep the companies in conservatorship forever with only intention of bankrupting the companies at the cost of private shareholders? can you write an article in SA about this question ” whether PSPA violates HERA because FHFA put itself in a position of being subject to Treasury” ? i have thought about it, but the fact that this case has not been brought (yet) indicates that it may be a stretch. nonetheless, i think there is merit in the notion that congress intended fhfa to be “in charge” of any rehabilitation it pursued as conservator, and that to the extent fhfa gave up control or discretion to any creditor within the context of a financing arrangement, that creditor should be a bona fide lender not subject to (possibly conflicting) policy views (or mandates) that might conflict with those of fhfa…and one might certainly look at the current situation and conclude that fhfa’s mandate as conservator is subject to the direction of treasury’s policy mandate to “wind down” GSEs…and this is precisely the sort of situation that the HERA “not subject to direction” provision sought to avoid. again, it is not inappropriate that treasury has its own policy views, nor that these views might conflict with fhfa’s views. it’s just that congress seemed to require in HERA that fhfa should not be subject to this sort of policy conflict. this would have avoided the whole “regulation by financing” issue that the GSEs face. didnt secretary watt himself testify before the house financial services committee that the agreement (PSPA) change the law (HERA)? of course, that is backwards. while HERA states fhfa shall not be subject to the direction of any state or federal agency, it also states that treasury may purchase securities and exercise rights received in connection therewith. so all of treasury’s creditor rights under the PSPA are enforceable against fhfa, notwithstanding the not subject to the direction language. however, this doesnt authorize treasury to direct fhfa to enter into NWS, and perry alleged this in its complaint. judge lamberth dismissed this saying not one single objective fact had been produced to indicate treasury direction in connection with NWS. of course, on a motion to dismiss, one need only need to plead the fact, not prove the fact. Legal Experts who were involved in writing HERA have already said that PSPA violates HERA. If you think that the case should have been brought already, write an article asking why not? maybe nobody thought about it. Nobody thought about the Delaware case until recently when Judge Steele brought it. Why would FHFA director say that the laws have been trumped before he became director? As a creditor nobody gets to own the company without due legal process in courts. Here creditor and conservator are the same entity. Conservator is a Gov employee under the direct supervision of creditor/Gov. Gov has the authority to dismiss FHFA director. There are strict laws to prevent any conflict of interest arrangements to defraud shareholders. HERA is not a standalone law. It needs to be interpreted along with other applicable laws. Here what matters is the end result. One can not use fuzzy logic, fuzzy math or fuzzy laws to defraud the shareholders and break the laws. In FnF case this is the issue and not the laws themselves. The facts are clear. FnF never asked for Gov help or bailout because FnF did not need it. Gov help and bailouts were forced on FnF based hidden bureaucratic decision making process with unknown motives. You can not have valid laws to seize and nationalize net worth positive private companies without compensating the owners. At the time of seizures FnF were net worth positive. For any compensation this becomes the baseline. Tim , do you think that Ginnie Mae can keep growing and taking share from FnF ? Or eventually replace them like one of the 2014 bills in Congress proposed? Is that something that Congress will promote or oppose ? I honestly haven’t been following Ginnie Mae that closely. Ginnie Mae securitizes FHA and VA loans, so if Ginnie is taking share from Fannie and Freddie, it’s most likely because the FHA (and possibly VA) have more liberal underwriting standards than Fannie and Freddie. My advice to the companies, though, would be not to worry about that, and to stick to the underwriting standards they believe make sense for them. As to the issue of Ginnie replacing Fannie and Freddie, remember, Ginnie does not guarantee loans; it just packages loans guaranteed by the FHA or VA into Ginnie Mae securities. Trying to replicate Fannie and Freddie’s credit guaranty business within Ginnie Mae would be a disaster. Can you estimate how much is the minimum capital that Fannie and Freddie need? Sue: At this point I can’t put a number on it, because it depends on component parts that don’t yet have sufficient consensus. To derive a minimum capital number for Fannie and Freddie, you’d need: (a) an agreed-upon “stress level” of loss the companies are required to protect against (when I was at Fannie, we got that from Paul Volcker, and it was incorporated into our 1992 regulatory and capital legislation; the private-label-security induced calamity in the mid-2000s made that stress standard irrelevant); (b) an identified “worst case” mix of business Fannie and Freddie are able to purchase or guarantee, and (c) a target return on capital for the companies– either self-determined or imposed via regulation or legislation. With these three inputs, you can determine both the average guarantee fee Fannie and Freddie would need to charge, and the minimum amount of capital they would need to hold. The greater the amount of stress you want the companies to be able to withstand, the riskier the business you wish them to finance, and the lower you want their guaranty fees to be, the larger the amount of minimum capital they will need to hold. Tim, thanks for all the replies, your insight is very helpful. People keep throwing around a 5-10% capital number. Given what it was pre-conservatorship, do you think that’s remotely reasonable? That represents a ~10-20x increase in capital, doesn’t it? So they need about 100 billions. That is what Treasury has taken out of the GSES . Am I right? Partially. First of all, if the companies had a 250 basis point capital requirement, with $5.0 trillion in combined assets they’d need $125 billion in capital, not $100 billion. And the definition of what Treasury has “taken out” of Fannie and Freddie depends on the outcome of the legal cases. Treasury contends it hasn’t taken anything out, and that the companies still owe it the $187 billion non-repayable liquidation preference of their senior preferred stock outstanding. The most aggressive position on the other side is that the $187 billion in senior preferred stock was forced on the companies through accounting entries made on their behalf by FHFA, therefore Fannie and Freddie shouldn’t owe any dividends on it, and all they have to do is repay the $187 billion they didn’t need in the first place. If that position prevails, with their first quarter 2016 net worth sweep remittances Fannie and Freddie will have paid Treasury $246 billion, so Treasury would owe the companies close to $70 billion. That’s over half what they would need to meet a 250 basis point capital requirement. This blog is a great resource for anyone interested in the GSE’s. Your book is also fantastic! I have a question about the DTAs. Since the ‘Valuation Allowance’ was the contra asset account used to write off the DTAs during the crisis, where did the DTAs come from in the first place? Aren’t these deferred tax assets representing NOLs from previous years that could be used to shield taxes in the future? If so, when did the GSE’s incur such heavy losses to warrant billions in DTA assets? Alec: You’ve asked three good questions, which I’ll try to answer as briefly as I can. Deferred tax assets (or liabilities) result from differences between when income or expenses are recognized for book accounting purposes and when they can be recognized for tax purposes. As a rule of thumb, you’ll have a deferred tax asset whenever: (a) you recognize an expense on your books before it is allowed as a deduction for tax purposes, or (b) you defer income for book purposes that the tax authorities believe should be taxed in the current period. Fannie used to have relatively modest amounts of deferred tax assets, but in the aftermath of the “accounting scandal” at the company in 2004, the director of Fannie’s regulator, Armando Falcon, insisted that the company change its accounting to what he characterized as “the most conservative form of GAAP.” In a general sense, the most conservative forms of GAAP are applications that defer the recognition of income for as long as possible, and book expenses (or anticipated expenses) as soon as possible. Well, if you do that– and Fannie did– you’ll get deferred tax assets (DTAs). When FHFA insisted that Fannie create a reserve for its DTAs right after the conservatorship, those DTAs totaled $21.4 billion. But then, as FHFA kept adding non-cash expenses to Fannie’s post-conservatorship financial statements–which the tax authorities didn’t recognize as legitimate deductions–Fannie’s DTAs continued to rise. By the time Treasury instituted the Net Worth Sweep, Fannie’s DTAs, and the reserve against them, had reached $64.1 billion. FHFA then released the valuation reserve, and all of it went to Treasury. Do you know about how and when the information about mortgage misrepresentations/fraud by FIs was reported? Is this part of the protected information withheld from public? Is it not important to know when bureaucrats knew about fraud committed by FIs on FnF? If they knew this before 2008 conservatorship then it becomes evident that FnF seizure, conservatorship and SPSA were in some way cover ups to hide the frauds of these FIs. My recollection of the timing of the disclosures about lender misrepresentation of the characteristics of some of the mortgages they delivered to Fannie and Freddie was that it became publicized at around the same time “robo-signing” of foreclosure notices came to light, which was in the fall of 2010. (Those foreclosure notices triggered “post-purchase reviews” of the associated loan documents, uncovering the fraud.) I don’t believe the scale of misrepresentation was known prior to the conservatorships. Had it been, Fannie and Freddie managements would have strong incentives to require lenders to repurchase or replace the fraudulent loans, and would have done so. It is easy to speculate on this, unless some one confirms otherwise. FnF must have employed hundreds of risk and fraud analysts analyzing the historical and current data. Probably pre-c’ship FnF managements may have known more about it or were planning to act on it. Why did conservator put gag order on FnF instead of just banning lobbying? Are there any precedents where conservator puts such gag orders on conservatees? Possibilities exists where conservatorship and gag order preempted such corrective actions by FnF management. In any case such corrective actions by FnF management would have made the crisis worse than what it was already. May be this was damage control option. At least when I was at Fannie, we didn’t have anyone I would describe as a “fraud analyst.” While fraud occasionally would occur, we generally were able to detect it in lender audits and post-purchase reviews done by staff in our regional offices. And I’m not aware that the conservator has imposed a “gag order” on Fannie employees. There IS a ban on lobbying, but that was imposed by FHFA’s predecessor agency, OFHEO, shortly after Frank Raines and I left Fannie at the end of 2004; it did not occur in the wake of the conservatorship. It is well known that conservator imposed gag order on FnF after FHFA take over . Even without gag order, employees are not allowed to talk about the company matters except designated officials. It is surprising to know that the biggest financial companies in the world did not have dedicated fraud prevention team. But when loans assets in billions start failing it does not take much time to find out what is happening. It may be reasonable to assume that FnF management knew about it long before conservatorship. What is the evidentiary value of “Financial Crisis Inquiry Commission” report and conclusions in courts? Can defendant’s attorneys credibly disown this report and challenge it? I don’t have an answer for you on that; it’s outside my area of expertise. Following is an excerpt from the DOJ/Treasury brief in the Perry Appeal case of Judge Lamberth ruling re the NWS. We know that you have access on that brief. Appreciate any input on . You have done some forensic accounting, What do you see on the claim that FNF lost $108 B in 2008 alone. Was the acceleration of DTA involved? Do you think they “manipulated” the books? “with the 2008 collapse of the housing market, Fannie Mae and Freddie Mac experienced overwhelming losses due to a dramatic increase in default rates on residential mortgages. The enterprises owned or guaranteed over $5 trillion of residential mortgage assets, representing nearly half the United States mortgage market. TR85(J.A.528); TR3812(J.A.1878). Their failure would have had a catastrophic impact on the national housing market and economy. The enterprises lost more in 2008 ($108 billion) than they had earned in the past 37 years combined ($95 billion). TR3814(J.A.1880). As a result, the enterprises faced capital shortfalls. TR212(J.A.629); TR3809(J.A.1875); Dkt.51, at 4(J.A.319). Private investors were unwilling to provide Fannie Mae and Freddie Mac with the capital they needed to weather their losses and avoid receivership and liquidation. I addressed the issue of Fannie and Freddie’s post-conservatorship “losses” in both the Perry Capital and the Delaware amicus briefs. The very large majority of the $108 in losses the companies reported for 2008 came after they were put into conservatorship, and resulted from non-cash expenses booked on their behalf by FHFA. These included not only the reserve on DTA, but also large increases in loss provisions and write-downs on private-label securities. Treasury’s statement that the companies “lost more in 2008 ($108 billion) than they had earned in the past 37 years ($95 billion)” conveniently omits the fact I noted in the Delaware amicus: all those 2008 losses, and much more, came back to the companies as profits after the net worth sweep was imposed–proof that those losses hadn’t been real in the first place. And the statement that “Private investors were unwilling to provide Fannie Mae and Freddie Mac with the capital they needed to weather losses” was true after the conservatorship, but not before. In the final brief in the appeals case treasury states that the gse’s increase in net worth was due to in part to deferred tax assets. If treasury insists that they did not know about the DTA’s, even though the IRS works under treasury, would the DTA’s show up under their corporate tax documents? There’s a lot wrong with Treasury’s story. Its position on the DTAs is only part of it. Its biggest problem is that if you’re accelerating a company’s expenses–or artificially inflating them– as FHFA and Treasury were, that company’s net income will jump upwards as soon as you run out of expenses to accelerate or inflate, which has to happen at some point. Treasury had to have known that. As far as the DTAs go, everyone knows about them. The issue is that FHFA had set up a reserve against them, effectively writing them off, claiming that Fannie and Freddie never would be profitable enough to utilize them. Here, too, they and Treasury had to know their position on the DTA reserve wouldn’t hold up. Because the companies’ losses had been temporary or artificial, they were destined to return to profitability at some point, and when that happened the DTA reserve would have to be reversed. Treasury can maintain it didn’t realize that, but that position is not credible. Do you think that the GSEs should exit the Fixed Income Arbitrage business and dedicate exclusively to the guarantee business like Ackman proposed back in 2014? Do you agree that in this case the GSes do not need any guarantee from US ? Is this what some people like Bercovicz are calling a utility model? Eric: I don’t advocate Fannie or Freddie exiting what Ackman calls the “fixed income arbitrage” business (and I call just the portfolio business), but I do think it would be far easier to gain agreement on and support for a reformed Fannie and Freddie if they ran their portfolios as ancillary to their credit guaranty functions, rather than as stand-alone, profit-making businesses. I don’t believe Fannie’s or Freddie’s credit guaranty businesses “need” a government guaranty, but I think they would be far more effective, and would be able to do a much greater volume of business on far better terms for homeowners, if they had some form of support from the government. And I don’t know what Berkowitz or others are envisioning when they use the term “utility model.” When I use it, though, it’s to refer to a business structure in which Fannie and Freddie agree to give up aspects of control that a shareholder-owned company normally has–by, for example, agreeing to accept regulated returns–in exchange for some type of implicit or explicit support from the federal government. I’ve always felt that this sort of exchange of restrictions for benefits has great promise and potential. You replied as follows in one of the questions posed on comments. I know you do not want to be specific but based on your experience as former CFO and extensive knowledge can you elaborate on “building blocks” on reform proposal? The court is one of the building blocks, so if NWS is deemed illegal, then what is next on the building block? I don’t think of the court process as a “building block.” In the context of reforming the existing entities, Fannie and Freddie, building blocks to my way of thinking are things like their relationship with the government, their level(s) of required capital, the degree of autonomy granted their shareholders, the structures of their guaranty and securitization functions, and the nature and extent of their affordable housing incentives or requirements. There are different ways to do all of these, and the way they ultimately are done will affect the efficiency and effectiveness of the system we end up with. Thanks., Your” building blocks” are great!!!! I agree with you court ca it is not part of the “building blocks” but just the catalyst that will initiate discussion on the reform as no meaningful discussion on the reform, can be started with the political players on both aisle(white house, FHFA, Congress, Treasury, supporter and haters of GSE) if NWS sweep is in place. Congress in the Omnibus bill has disallowed Treasury to sell their preferred shares until Jan 2018, and as Watt has indicated FNF’s level of capital makes FNF vulnerable for another draw which will arm those who hated GSE/FNF to say “we told you so and justify the wind down”. POTUS will not touch nor start a discussion during the remainder of his term as he uses the NWS to balance the budget while Corker’s objective is to run FNF to the ground by preventing them to retain capital. Hopefully the third branch of our government will rule in favor of plaintiffs to start a serious discussion on the “building blocks” of reform process. Unless and until the lawyers challenge certain aspects of HERA and the Omnibus bill as unconstitutional and the courts agree, we will be in a deadlock for a long time. I agree that there must be successful court challenges to Treasury’s arrogation of powers and control over Fannie and Freddie–which it was not given in any statute–as well as many of Treasury’s actions affecting the companies, before there can be significant progress in effecting changes in any of the “building blocks” I mention above. You said below , answering to Eric, that Treasury sent 116 B cash to Fannie but delayed between 2009 and 2012. Then you add that Fannie used the proceeds to pay down its own debt. Do you mean its own debt with Treasury? If Fannie received the money not in 2008 but between 2009 and 2012 .. why does Fannie pay 10% interest from day one (Sep 2008) on the total amount ? …or I am getting it wrong? Sue: On the first question, no. When Fannie got cash from Treasury, it used that cash to replace Fannie Mae debt it otherwise would have raised in its regular debt offerings. On the second, the difference in the years of Fannie’s book losses and Treasury’s injections of cash has to do with when the company releases its earnings. Fannie still had positive capital in the third quarter of 2008, and it didn’t release its fourth quarter 2008 earnings (when it did show negative capital) until late February 2009. That’s why the first Treasury payment was in 2009, and also why other Treasury payments seemed to be delayed. And I don’t believe Fannie paid interest on the preferred stock “from day one (Sept 2008),” it should have been from when they received the capital. So you mean that Fannie used the proceeds at 10% interest to replace debt that would have cost 1% if raised in the regular offerings? Or maybe much less than 1%. Essentially, yes. Fannie had no choice but to do that. That seems to be the case. Instead of letting FnF use the existing credit lines or get new credit lines based on FnF collaterals, FHFA conservator forced expensive toxic cash on FnF which FnF did not need. Then FHFA conservator forced FnF to issue 80% warrants saying that taxpayers took the risk. Clearly it was not conservatorship in any traditional legal or historical meaning. It was done to show that FnF caused the 2008 crisis pursuing Gov mandated affordable housing goals. Massive accounting write downs and large cash infusions were used as the supporting evidence. SPSPA and 80% free warrants never makes any business sense . I think your article is very well done, and the based on the assumptions you put forth the conclusions you reach–including on valuation–seem reasonable to me. But to do a “going concern” valuation of Fannie Mae at this point, one has to make a LOT of assumptions. I’m leery of doing that, for a variety of reasons. In addition to there being judicial uncertainty about the company (which you address), there also is political and competitive uncertainty. I would express it this way: if Fannie returns to the market as a shareholder-owned company, but with continued opposition of critics who seek to replace it (and Freddie) with an alternative mechanism, it will look, operate and be valued much differently from how it would look, operate and be valued were it to be generally accepted as the most effective form of secondary market financing we can come up with. Those differences include “transitional costs” from its current state to its future state (and I would put whether Treasury’s warrants actually get converted into that category), its required capitalization, its earning power (which will be less if it’s structured following a utility model) and its ongoing P/E ratio (lower for a company with more political opposition). When I take all of these uncertainties together, I give up thinking that I’m able to put a value on Fannie Mae a few years out–at least for now. Fannie Mae’s cash flow statements show Treasury sent $116 billion in cash to Fannie (but on a delayed basis, between 2009 and 2012). Because Fannie’s losses were non-cash losses, however, when Treasury raised this $116 billion in the market (adding to the federal deficit) and sent it to Fannie, Fannie used the proceeds to pay down its own debt. None of this should have been necessary. i agree with your comments, though as a special situations investor, i have to take a stab at valuation if i am going to invest, and if i do the work, i might as well share it for smart people to critique. i have thought about what sort of ground rules would need to be put in place in order for a successful recap to occur. this would go beyond simple “governance” issues, and gets at the future role of Treasury and FHFA in the GSEs. my sense is that if congress could not agree to replace the GSEs when their equity was zip, congress will certainly be hardpressed to do so when their equity values go above $100B. the default choice of continuing the GSEs mostly as is will prevail in my view, and whatever changes are needed to recap will be implemented in order to recap. as usual, money considerations will predominate, and inertia will continue to be the strongest force in the universe. I’m out of here, Tim. I’m asking clarifying questions that when answered would help flesh out unspoken premises that can make your previous assertions intelligible. These posts continue to disappear even once among with one of your responses. Thanks for your efforts just the same. Ron: Your choice, obviously. I want to try to keep this site readable, so if I believe that on a particular topic there are excessive comments or followups that won’t be of interest or informative to the typical reader–or if I feel someone is just using the site as a means of “airing their views”– my policy is to not accept those comments. I’m doing this not to block comments or opinions I don’t like; those always are welcome, and I will respond to them as best I can. The opposition has yet to put forth an alternative. Had they one I think we would have seen it by now. If we prevail in court, it’s not as though the opposition will all of a sudden find an alternative. Mind, the opposition has never been about an alternative, let alone an alternative that’ll avoid another crises. We can be sure of that because they could care less that the GSEs aren’t capitalized when they easily could be. Secondly, it’s become more apparent than the lack of evidence for the WMDs(!) that the housing crises was fabricated and then pinned upon the twins. All that said, any political opposition to a non-threat of being to big to fail and no alternative to boot can have little effect on pps or P/E ratio. As for the warrants, the math is easy. 20 dollars per shared fully diluted. I agree in part with the part about regulation, but there are also offsetting factors that could be favorable to corporate profits under such a scenario. Lower SG&A without losing talent for one thing. But a more fundamental question obtains. Why increase regulation if the crises had nothing to do with a failed business model and everything to do with political incompetence if not malice aforethought? I wouldn’t underestimate the effect of political or regulatory opposition on a company’s P/E. In 2003– the year before the private-label market began taking market share away from Fannie Mae (and a year before I left)– we had a terrific business model, were running that business well and were extremely profitable, but because of political and regulatory opposition we had a P/E of less than 10 when the P/E of the S&P 500 was well over 20. Do you recall the change in p/e of the twins after the implementation of private label? Thx! Not precisely, but it wouldn’t have been much. The big decline in Fannie’s P/E was between the end of 1998 and the end of 2003: in that time Fannie’s earnings more than doubled, but the stock price was essentially level, cutting the P/E in half. (Most analysts felt this was due to what they called “political risk.”) The private-label market really took off in 2004, but Fannie’s P/E didn’t fall much further when that happened. Can you please email Charlie Rose about this? who can demystify many myths about FnF. Thanks Bob for your comments. Actually I have tweeted Charlie Yesterday and will follow up again in the next couple of days. I think you are one of the most qualified guys to come out with a win-win solution. I think the POTUS will love to leave the WH being the man who fixed the GSEs instead of letting this skeleton in the closet. Something that allows Treasury to keep the money already taken and gives all the upside to the shareholders. In this kind of agreements the time is always an allied (long terms). The goal should be avoid the dilution that re-capitalization would produce. For example Treasury may keep the non paid or a negotiated part of SP at a reduced normal rate of interest but offer it as collateral for capital. Treasury may exercise the warrants with the commitment of not sale them in the market but allow the companies to buy them back at a nominal negotiated price after a period of time. What about the G fees ? can the g fees be packed as securities and sold for capitalization ? Eric: So far I’ve deliberately stayed away from coming up with my own formal proposal, largely because the more time passes–and the more facts work their way into the debate about what went wrong and how the system might be fixed–more and better possibilities for reform move from the category of “pie in the sky” to potentially feasible. For that reason, I’ve felt that coming out with something too specific too soon would be a mistake. What I’m thinking of instead is, over time, discussing the “building blocks” of a successful reform proposal, to be assembled later based on what seems to be practically and politically attainable then. I see. How long do you think that it will take until the right time comes? It may take until there is a definitive ruling in one of the court cases, but it could be sooner than that. Now the most staunch opponents of recapitalizing Fannie and Freddie come up with objections to even innocuous proposals for reform (that include some version of the companies), so any ideas that are put out there get much more criticism than support. That’s why I like the building block approach: the component parts are more likely to get support rather than criticism, and when the pieces are pulled together into a full proposal it will be for an audience pre-conditioned to be more receptive to it. I am glad to know that your mind is already working on the issue. I understand your rationale behind not ending the conservatorship because of the net worth sweep. But allowing them to retain capital is an entirely different matter. Am I wrong in thinking that Obama just put a guy in charge of FHFA who would never take action on his own? Yes, I did see it. It’s a “non-response.” It’s become increasingly clear that, for whatever reason, Watt is unwilling to challenge Treasury on any major issue relating to how Treasury wants to run the conservatorships. He’s not in a good position, however. Just saying “We’re waiting for Congress to act on reform” won’t work. Congress isn’t going to act on reform, certainly not this year. Pressures are building on Watt to find some way to show that FHFA is not totally under the thumb of Treasury, and I wonder if he’ll conclude that he needs to take some types of actions that show at least a modicum of independence. Would you opine that he’s actually doing his best to demonstrate that FHFA is under the thumb of Treasury to remove any chance of him being blamed if/when the government loses the trials? I wouldn’t go that far. The sweep was agreed to before Watt became Director. I have no direct information, but suspect that Watt legitimately does not know what to do to resolve the dilemma he and his agency are in, and given that uncertainty is reluctant to make any moves that might antagonize Treasury. I’m just not sure how long he’ll be able to keep that posture up. Your blog is very informative. Thanks for your time and effort. Was wondering if you had any initial thoughts on the new shareholder court case in Miami, Master Sgt. Edwards vs Deloitte and Touche, where the plaintiffs claim Deloitte manipulated the books of Fannie to overstate losses and understate assets by hundreds of billions of dollars? I’ve taken a quick look at the suit, at least the sections that contain the allegations. I can’t handicap its chances of success, although I think the plaintiffs have very good arguments on the deferred tax assets and good arguments on loan repurchases (loss reserving–as egregious as it was–and FAS 133 are a little trickier, just because companies, and their auditors, have considerable latitude in those areas). Also, there is a double standard on understating versus overstating net income: the latter invariably is viewed as bad, the former typically as ‘conservative.’ I don’t think Deloitte would even have considered signing off on comparable overstatements of Fannie’s net income, although in theory both over- and understatements are equally misleading to shareholders. Beyond that, I view this suit as another credible counter to Treasury’s fiction that its takeover of Fannie (and Freddie) was a “rescue” of a troubled company, and evidence that Fannie and Freddie are failures as a business model. The more attention is paid to what Treasury did to the companies–and the more detail is given about it–the harder it’s going to be for Treasury to get away with calling its treatment of them a rescue. The suit may also provide convincing evidence of Treasury’s and FHFA’s actions and intent if plaintiffs are successful in getting access to the auditor’s work papers, although that could take a while. So, based on your knowledge of FNMA and accounting practices in general, the allegations (if true) might be difficult to convince a judge/jury simply because an auditor has huge leeway in the way they present their reports? No, I think that’s too broad a statement. I’ll break the issue into two parts. First, for most accounting standards, depending on the nature of the transaction and its circumstances, companies can choose among different accounting applications and still be in compliance with GAAP. But some applications are not in compliance with GAAP, and it’s the company’s job not to use those, and the auditor’s job to point it out when they attempt to, or to refuse to certify the standards if they persist. Auditors have their own set of auditing standards (GAAS), which I’m less familiar with but believe also have some leeway for interpretation. The lawsuit in question claims that Fannie Mae violated GAAP in many aspects of its post-2007 financials, and that Deloitte and Touche, in certifying those financials, violated both GAAP and GAAS. The plaintiffs may well be right. I think they ARE right on the deferred tax assets, likely are right on the loan repurchases, and may be right–but will have a tougher go of it– on loss reserving and FAS 133. As to your second point, the plaintiffs could be right in their allegations, but still fail to get a judge or jury to agree. These are complicated, technical issues. Thanks again for all of your great insights..
WB: I’m in agreement with you. That’s why this will be a very interesting case to watch. On page 95 of treasury’s financial statement https://t.co/BhisJRYeXM it states that the investments in gse’s as of Sept 30 2015 [fannie/freddie senior preferred stock] had a cumulative loss of $97.2 billion.on their investment on $189.1 billion investment. Can you explain how they value their loss on the senior preferred stock? I looked at the section you referenced, and it says, “the fair value of the senior preferred stock considers the amount of forecasted dividend payments…assum(ing) that a hypothetical buyer would acquire the discounted dividend stream as of the acquisition date.” So it seems they’re saying: “Forget the $241 billion Fannie and Freddie already have paid us on this $189 billion ‘investment’ (which would give it a positive fair value); we’re only going to count the forecasted future dividend stream from this point, and if we do that, we get a fair value loss of $97 billion.” Yes, and if you don’t count any income at all– past or future– you’ll get a fair value loss equal to the amount of the investment. I think the $97 billion loss is a completely meaningless number, designed to make it seem as if Fannie and Freddie still owe Treasury something. I am not sure this is the right place to post an unrelated question for Tim, however, this spot allows me to at least throw the question out: Tim, are you the owner of timhoward717.com? I have been following that blog for a couple of years, then no more posting since 2-15-2016. Just thought I will ask for all the people on that board. Thanks! Eric: No, it’s fine for you to ask that. I have no connection with the “timhoward717” board, nor do I know who the person is who has chosen to use that name. In the next column you can see valuation gains/losses. Even though some may say that FnF have not paid back $187B, auditors may not agree with that. Fair accounting rules are applied to get realistic numbers. Probably they are using depreciation to account for payment without admitting that the investment have been paid back. 1- The sale and short sale of securities based on insiders information or knowledge . Even FDIC sold securities knowing that gov was actions would render them worthless. 3- The self dealing signature of PSPA with no deliberative process and its malicious nature. 5- The Net Worth Sweep. My question is how does the statue of limitations apply here? If during the trial of Washington Federal it gets proved that there was accounting fraud, can it open the way to new lawsuits? Sue: I agree with your premises and you’ve asked two good questions–for a lawyer to answer. We have, I’ve noticed, no shortage of lawyers in our society, and I’ve determined to stick to my comparative advantage in mortgage finance and not try to compete with them. Any lawyers reading these comments should feel free to offer their views on Sue’s queries. Please rethink after reading below possibilities. When FnF were seized, put under conservatorship, assets were massively written down, forced with massive punitive PSPA investments, and also blamed for 2008 Crisis, what was the response from investment community, media and public? All believed whatever WS officials publicly said and supported WS officials actions without verifying the facts. WS officials placed gag order on FnF including BOD/CEO and completely controlled all the information in utter chaotic environment of 2008 crisis. Access journalists (Media) willingly complied and perpetuated the myth that FnF were the real culprits. Expropriating the assets of two shareholder-owned companies was after thought decision as an added bonus of conservatorship. Handing over trillion dollar business from FnF to TBTF entities were also after thought decision as an added bonus of conservatorship. These were after thoughts actions by emboldened officials when nobody questioned their motives. Conservatorship/PSPA was diversionary strategy to direct the blame on FnF and create favorable optics for the FIs that caused 2008 crisis and who badly needed real bailout. This was all necessary because the mood of the nation and the congress was anything but favorable to these FIs. By making FnF look like real culprits who caused the 2008 crisis WS officials created the impression that FIs needed bailouts because of FnF. Also they blamed affordable housing policies as a cause for 2008 crisis to divert the attention from FIs. This was done really to get the much needed bailout for FIs, and to protect them from blame for all fraudulent practices. So FnF were seized, put under conservatorship, assets were massively written down, forced with massive punitive PSPA investments, and also blamed for 2008 Crisis. Positive acceptance, no resistance from investment community, media and public, also absolute success in bailing out FIs of their choice, emboldened officials in exacting next added bonuses. FnF returning to profitability was bad news for these people. They did not have much choice but to implement third amendment by trumping the laws. This time unexpected investor awareness and lawsuits became the starting point for ending the conservatorship. There were far superior alternatives to bring liquidity and stability to markets than FnF seizures, conservatorship, PSPA. But these far superior alternatives also meant that blame would be directed to FIs that were responsible for the crisis, Fis may not have got the large taxpayer subsidized bailouts. BTW this is how things work for rich and powerful. get out of the mess they create and still emerge winner. How about vulnerable people? They are always losers. What might be construed as opportunist after thought(s) vs calculated / premeditated takings makes for tantalizing speculation, indeed. Not sure how relevant that is to rule of law as it relates to NWS, though these considerations should find their way into any ensuing *criminal* suits. Of course damages would be directly related to motive. BTW, in AIG case, plaintiffs proved harm. But did they prove malicious intention? The judge in the AIG case did not award damages because AIG literally had no other option. Either they accepted the government bailout or they went bankrupt. No private institution would touch AIG due to unknown derivative contracts. They had CDS contracts drowning them and when they were downgraded to triple BBB, the CDS contracts had to be paid out due to a clause in the AIG contract. I believe the judge essentially ruled that the federal reserve could not demand equity on a 13 (3) loan, however he did not feel comfortable awarding damages due to the fact that AIG was better off with the bailout even with the harsh terms versus going bankrupt. Pretty much the thinking being that a penny is better than nothing. Plus if you read through the AIG ruling, it is clear that the government did a bailout of AIG so that they could honor CDS contracts to investment banks like goldman sachs. Using taxpayer money to pay bets to investment banks, really makes a lot of sense. FnF shareholders need to have correct and consistent narratives/motives on how they were harmed. FnF shareholders need to present correct plot and also correct motives for the plot. Then only Juries and Judges are going to believe them. Otherwise Juries and Judges will think that things were done in the interest of nation and have less favorable opinion for FnF shareholders. It is also necessary to have favorable opinion of public and media. If FnF shareholders do not get facts correctly then defendants can easily un-construct shareholders arguments. It may not be just enough to prove the harm, they have to prove that there were better alternatives available and intent was malicious. Remember it is the plaintiffs who have to prove the malicious motives and harm. FnF shareholders need to prove that there were far superior alternatives to bring liquidity and stability to markets than FnF seizures, conservatorship, PSPA. But these far superior alternatives also meant that blame would be directed to FIs that were responsible for the crisis, and FIs may not have gotten the large taxpayer subsidized bailouts. It is doubtful to think that WS/WDC Elites planned all these anti-FnF acts in advance. Their initial motive was to save/protect themselves from the blame and get the taxpayers bailout with best possible terms and conditions. But mood of the nation and the congress was anything but favorable to these FIs. So they needed a somebody to blame for the crisis. FnF have been closely associated with Gov in promoting public policy of affordable housing, very large, and easy to blame. Most people still think that FnF are Gov agencies. Politicians and most public love bashing anything to do with Gov. So WS/WDC Elites picked FnF as a perfect victim to serve their purpose. Initially Hank wanted to put FnF in receivership but that did not work out. So next option was receivership in the guise of conservatorship. But the PSPA, the concrete lifesavers failed to sink the gaints or FnF business models proved to be too good. It appears, there after plot developed as things happened. The question is whether the *law* was broken with the NWS. Related is whether the conservator had the *legal* right to do x and not whether x was sound practice (though those two considerations are closely related too). Motive and intent play no part in these narrow deliberations. Current focus is on *civil* not criminal aspect of events. We lose there then it’s irrelevent what motives might have triggered “legal” actions. tell me again how your hands are tied and that Congress needs to tell you what to do…. Beautifully expressed Tim! Keep in mind also, as we discussed in these comments a few weeks ago (re your thoughts on the Delaware amicus curiae brief), that the Government’s Preferred is, in fact, subject to redemption by the GSE’s (Per Section 3 of the Certificate of Designation for the Preferred – “Optional Pay Down of Liquidation Preference”). It is not a perpetual preferred, though it cannot be repaid until “termination of the commitment” (which Treasury, conveniently, controls). Still, it might take less to prove (1) that the Treasury manipulated the continuation of the commitment (not allowing for “termination of the commitment”) and thereby deem that the more than $200B sent to Treasury so far has resulted in repayment/redemption of the Government Preferred (thereby reducing or wiping out the obligation to continue to pay $18.7B @10%, prior to the net worth sweep) than (2) that the entire conservatorship was illegal (though I agree with you, the facts suggest it was)… This is important. Without the net worth sweep, there would be no $18.7B dividend to Treasury annually, as the Government Preferred would be repaid (under any reasonable interpretation of fairness, in accordance with Section 3 of the Certificate of Designation). The WSJ Heard on the Street “columnist” John Carney conveniently ignores this, as well as the claims in the Washington Mutual case, in his recent distorted musings… Tim – I would appreciate your thoughts on this… Thank you for your passion for the truth! WB: You make a very important point, that helps explain the timing of the net worth sweep. After the companies’ second quarter 2012 earnings announcements, it was clear that both were on the verge of seeing huge increases in their net incomes as a result of the cessation and reversals of the non-cash losses booked prior to that time. Once that got going, and the companies’ retained earnings built up, it would have been much harder for Treasury to contend that there was any reason to maintain their commitment to support Fannie and Freddie through the SPSAs. It desperately didn’t want to allow the companies to be able to repay their senior preferred stock, and the best way to keep the pressure off itself to terminate the commitment was to sweep all the companies’ net income. In so doing, Treasury was able to: (a) greatly enrich itself, (b) maintain a plausible reason for not terminating the commitment–i.e., “you’ll still need it because without any capital you’ll require another draw at some point, because of your accounting volatility,” and (c) deprive the companies of the funds to ever build up capital again. It certainly was clever; now the courts get to determine whether it was “too clever by half.” My bet, as I suspect yours is, is that the courts will rule it was. Right on! Just another link to the unenforcabilty / illegality of the net worth sweep…So, while WAMU is an important case, one can argue that Judge Sweeny’s rulings in the net worth sweep cases may result in a determination that the Govt. Preferred shares have been effectively redeemed, the $18.7B dividend wiped out, and the fact that normalized earnings are below $18.7B moot… If WAMU prevails, then all the better – even the 79.9% might come back to shareholders..
How is the independent audit firm immune from scrutiny here? It isn’t. In fact, I understand that someone is preparing a suit against at least one of the companies’ auditors; if one actually is filed, I’ll be interested to see what allegations are made. As an aside, is part of the gov. deliberate action in court cases to prevent another Anderson debacle? Said another way, if it is proven that FHFA recorded inappropriate material reserves and the auditor did not catch it they look ineffective. That ineffectiveness casts a big shadow again over auditors (SOX) and signals problems at PCOAB. Then you get more uncertainty in the markets because it looks like the controls don’t work, again. I don’t think the courts (or the government) are focused on the auditing issue. And auditors have a lot of leeway in reviewing and approving a public company’s financial statements. That’s why, if there is a lawsuit against the auditor of Fannie or Freddie (or both), I’m waiting to see what’s in it before making any comments about its import or implications. I hope people now understand why I consider Tim Howard one of the smartest, if not the most intelligent, mortgage finance expert in the nation, including most of the Wall Street guys. He lived this business, fought the attacks and legal battles, and experienced setbacks and victories for most of the past 35 years. He’ll hate me for saying this but Tim Howard would be an excellent resource for the next Treasury Secretary, assuming Tim respected the individual and the new President. He’s forgotten more than many of the current Treasury counselors know. I would add one small point to an answer to a previous question, Mel Watt may be limited in dealing with Treasury but President Obama should not be. If there was an Administration will to make some executive change to the “Third Amendment,” BHO could drive that. Am i wrong in thinking there is a is a huge public political win available for whomever can message the return of the GSE’S to full health. With the current budget projections made by the White House, the Government could choose to obtain $162 Billion versus waiting ten years and continuing to fight numerous lawsuits. I think the problem with making the GSE’s returning to health a big win is the big lie. The government created the big lie that the GSE’s were entirely to blame for the financial collapse. The general population has latched onto this theory and it has now biased the average American, whom doesn’t even understand what the GSE’s do, against them. If you look at articles for and against the GSE’s the comments section is full of hateful ramblings about how “corrupt” they are and how they need to be shut down. Fixing the big lie would require many people in public office explaining why it was a lie in the first place and who really was to blame. This would also mean that a lot of people would be implicated as liars and others would look as though they got away with a huge crime (which is true). I honestly do believe the GSE’s will have to be released at some point, there is no way to sustain our housing model without them. If the GSE’s were replaced I think it would cause a larger collapse then what we saw in 2008. Capital to back mortgages would be little and interest rates would be very high. This is based off what I read in the beginning of “Mortgage Wars” by this blogs author. But I would appreciate Mr. Howard’s thoughts on any possible theories about how to restore the GSE’s good name in light of the big lie which has destroyed their reputation. Chad: I certainly understand your point about what you (and others) call the “big lie.” But I’d offer a couple of observations about that. First, following the financial crisis and the demonization of Fannie and Freddie, purveyors of the big lie got a huge head start, in that even those who knew it wasn’t true (and I’ve spoken with many of those people) didn’t speak up about it, because doing so would have removed them from the table of participants shaping the mortgage reform discussions. That’s now changed, so we’re making progress. (Yes, we’re still way behind, but that’s all the more reason to keep pushing to get the facts out.) Second, Fannie Mae faced a version of the problem you mention when I was at the company in the late 1990s and early 2000s. We had a lobby, FM Watch, funded by the large banks and mortgage insurers, that was very successful in putting out false information through friendly channels, and this distorted picture of Fannie Mae became widely accepted as true. We knew we couldn’t counter that, so we didn’t try to. What was most important to us was what key policymakers thought, and there we could go see them one-on-one, explain how and why the FM Watch message was wrong, and by doing that retain their support. I would submit to you that something similar is possible with mortgage reform. To prevent a rerun of the 2008 collapse, we don’t have to change the opinion of the public, just the key players who will determine the outcome of the Fannie/Freddie debate. That’s much more easily doable. Thank you for your reply Mr. Howard. 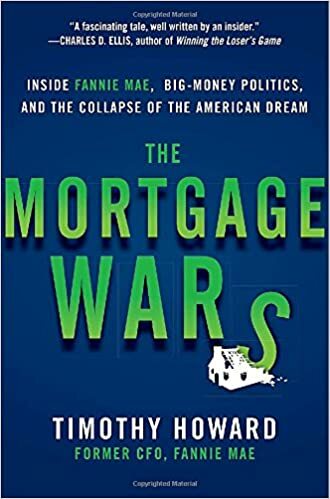 When I read your book and also “The plot to destroy Fannie Mae” a thought occurred to me about FM Watch, why didn’t Fannie Mae ever file lawsuits against that organization? Clearly based on their false and slanderous reporting, a defamation of character lawsuit would have been justifiable. I understand your argument that the public opinion isn’t nearly as important as the political one. But in hindsight do you think that having fought more strongly against that organization may have made it more difficult for the government to 1. Oust you and Mr. Raines, and 2. Take over the company? I think the negative view of the GSE’s spawned by the work FM Watch did made it much easier for the government to do what they did and makes it easy for them to continue abusing the Conservatorship today. If this would have happened to a beloved company like Apple the public outcry would have been great. But because it was the demonized GSE’s there has been very little and instead a feeling of justification for the activities over the past 8 years illegal or not. Can you speak to the question of if any consideration was ever given to legally combating FM Watch when they began their very public attacks on your company? Keeping in mind I understand that these questions do not serve any value now, it’s more of a curiosity to me as an interested party. It wasn’t just FM Watch. FM Watch was the co-ordinating entity, giving other opponents of Fannie and Freddie the cover and safety of numbers to put out the same sorts of misleading, distorted or inaccurate information. We discussed a number of possible moves we could make to respond to or counter their influence– lawsuits may have been among them, although I don’t specifically recall– but whatever it was that someone suggested, whether it was our own staff or one of our consultants, we always concluded that the potential downside of the idea outweighed the potential payoff. We certainly weren’t ignoring the issue, though. Michael: From my perspective, there still is far too much in flux– with the lawsuits, the politics and the state of knowledge about what the real alternatives are– to speculate at this point about what an ultimate resolution for Fannie and Freddie might look like. To put this in context, the plans you cite in your note would have been considered infeasible or unwise two years ago, and I suspect that in another year or two new plans will be developed and put forth that offer benefits that may not seem attainable (politically or practically) today. So I wouldn’t try to predict the outcome of this battle just yet. Even I, as an entrepreneur, who know a little bit about term sheets and shareholder agreements, was confused in the beginning about loss-reserves that the fed officials forced upon the GSEs as the subject matter was obfuscated by the officials and politicians. So you can imagine how the propaganda worked in favor of the wrongdoers (for a while). Fortunately, at least in my mind, there is a very straightforward solution. Let the government cancel and consider settled the PSPA obligations as if the 250 billion paid makes good on 187 billion plus the interest (which it does), let the government convert the warrants to common and let the government sell those commons in a world auction and release the GSEs. The government would easily get 100+ billion from such an auction. Then the GSEs can settle with the junior preferred shares. Just a thought. It depends on what your goals are. If you want to have a reformulated version of Fannie and Freddie serve as the foundations of the future secondary market system, you wouldn’t concede the warrants. I think Treasury’s having given itself 79.9% of the companies in exchange for doing nothing (other than using them as instruments of public policy) is outrageous and can be successfully challenged in court. Also, if they emerge from conservatorship, Fannie and Freddie will need all the tools they can muster to sufficiently capitalize themselves. If Treasury exercises and sells the warrants, it takes capital out of the mortgage finance system (with the proceeds going to Treasury, for whatever purposes it chooses), leaving Fannie and Freddie with much less capital-raising power because of dilution from the warrant exercises. That’s the opposite of what we should want. Tim Howard said it more eloquently than i could. Your suggestion is apparently for a quick fix. I’m looking for the CORRECT fix (read: rule of law). Otherwise your setting precedent for the government to keep stealing profits from private companies. The way I typically respond to this idea is that if the GSEs are released from conservatorship, I’ll personally have the funds required to challange the warrants. So will lots of other people. Even if an important group of people decided that executing the warrants was the correct path forward, this would get challanged and lose. Thank you for all of your efforts. It would be so wonderful to win both in DE and in Perry Appeal! Two Republicans, Stephen L. Fincher (TN-8) and Nick Mulvaney (SC-5) have written Mel Watt and Treasury Secretary Jack Lew asking them to explain by March 1st the implications for letting Fannie and Freddie remain without capital. In addition, Mulvaney has introduced legislation that would require the GSEs to begin building capital. very clear. great post. Thanks a lot. Thank you for your educated and experienced perspective into the conservatorships of Fannie Mae and Freddie Mac. As a lead plaintiff in two of the more than two dozen cases pending in the U.S. Court of Federal Claims, I very much appreciate the knowledge and insight you bring to our fight to save those two companies from what appears to be the illegal actions of Treasury and FHFA officials. Additionally, I read your book The Mortgage Wars when it was first published in 2014, and found it to be very useful in understanding how these two companies came to be imprisoned in their respective conservatorships. The history you offered on the adversarial relationship the two companies had to endure with their regulator, OFHEO, provides a solid basis for understanding our current situation. I do, however, have a question for you. In the epilogue titled Aftermath (pg. 268) you stated that, “The GSEs’ portfolios always will be controversial, and for that reason I believe that in spite of the fact that they performed well throughout the mortgage crisis, they should be wound down over time, at a pace dictated by the ability of capital markets investors to absorb the loans they contain.” Given what you know today, do you still feel their portfolios should be reduced? Thank you again for everything you are doing to change the current course for these two companies. Bryndon: Thank you for your comment. I do still believe that in any reconfigured version of Fannie and Freddie the portfolios ought to be wound down to a level consistent with the activities incidental to running a credit guaranty business. In future posts I’ll be discussing the “building blocks” of a successful credit guaranty business that works for both consumers and taxpayers (and, yes, I think the government ought to play a role in the secondary market for 30-year fixed rate mortgages, because done properly some government support can significantly lower costs to consumers, at minimal risk) but for now I’ll just say that I think it’s too hard to make the portfolio businesses of a “reformed” Fannie and Freddie work without going uncomfortably close to the features critics found so objectionable prior to 2008 (such as agency debt with the indicia of the old federal charter, relatively low amounts of capital coupled with rigid risk restrictions, and no constraints on the size or growth of the portfolio). It’s going to be hard enough as it is to get a functioning credit guaranty business going based on the Fannie/Freddie model; adding a portfolio business to that I’m afraid would be a bridge too far. And certainly no one would want to set up a portfolio business that wouldn’t have a realistic chance of succeeding. Do you think it would be beneficial to have Tim file his amicus brief with your cases? Thanks for your effort and opinions. I was the author of the body of both the Perry Capital and the Delaware amicus briefs, but they were submitted by (different) law firms. Those firms would be the entities to decide what else, if anything, to do with them. Is it true that there is a gag order in effect applicable to the pre- conservatorship boards of the gses? That’s the first I’ve heard of this, and I would be surprised if it were true. Who would have put such an order in place, and what mechanisms would they have for enforcing it? If any readers have contrary information, however, they should correct me. Hi Tim. I may not have the definitive information that would set the record straight. However, the board members at the time would be able to clarify. As we both exchanged related messages on a previous post here, I referenced a blog post of my own which discussed board consent (http://wp.me/p5jYux-eq). On a side note, I speculate that the plaintiff lawyers are disinterested in the possibility that board directors did not vote to approve the c-ships. If the directors did not approve (which Lockhart and Paulson both said they did), then they should have publicly denounced the action. Further, they should have filed lawsuits against the Gov. I assert that plaintiff lawyers ignore this point as that would make Fan and Fred themselves at least partially culpable (through their directors) for the take-over. If my conjecture is correct, I disagree with the plaintiffs’ strategy. The point is the Gov coerced the boards. So, to now postulate on the gag order question… Would you agree that it’s plausible that Paulson & Co. told the small groups he met with (CEO, GC, outside counsel) for each company that they should inform their board members not to fight the illegal take-over? Is it possible that non-disclosure agreements were received in exchange for the Gov not pursuing fraud, breach of fiduciary responsibility, etc. etc. etc. personally against each board member? Paulson was hellbent to intimidate and control everyone…! I’m no doubt a lone wolf on this one… not really sure why… Seems highly relevant and incredibly significant to me. And yes, I’ve heard the “Fog of War” argument many times, but I’m not buying it! What happened was wrong, no…illegal… and all of the facts should be made public. Evidently, we disagree on whether the point is relevant. From my understanding, the Delaware case if based completely on following corporate law. So, what is different in asking a) is a company allowed to pay in dividend it’s entire net worth to only one class of shareholder vs b) is the government allowed to claim that boards of directors consented (procedurally and legally voted in favor of) a conservatorship which in effect nationalized their companies? I don’t mind being the lone wolf here. One day the truth will be known. All most all appointment/separation agreements impose confidentiality conditions and also prevent employees from making any disparaging comments about employer. Companies pay some money in return for these type of agreements. Have previous BOD/CEO ever said anything? Previous FnF BOD/CEO are the ones who have much to say but not a single word from them. Confidentiality or non-disclosure agreements aren’t imposed on executives or directors; they’re agreed to voluntarily in exchange for something of value, typically a form of compensation. Fannie’s and Freddie’s executives and directors received nothing of value when the companies were put into conservatorship, so I don’t know why they would have agreed to any confidentiality restrictions. I doubt they did. Moreover, Fannie’s CEO at the time, Dan Mudd, has spoken about the conservatorships. His opinion about them is made clear in his two quoted statements in FCIC report. First, he said the sudden takeover was “inconsistent with what you would consider better regulatory practice to be–like, first warning, fix it; second warning, fix it; third warning, you’re out of here. They went from zero to three with no warning in between.” He also said, “I did not think in any way it was fair for the government to have been in a position of being in the chorus for the company to add capital, and then to inject itself in the capital structure.” I believe he has commented on the takeovers elsewhere as well, although I don’t have any quotes immediately available. Remember, too, that for the last four years Mudd has been fighting a lawsuit brought by the SEC against him and several others (all of whom have now settled, for nominal sums) on charges relating to disclosures of subprime loans. Having that suit still pending undoubtedly affects what he’s willing to say publicly about the conservatorships. Thanks. You have been there and you have seen these things first hand. Definitely you know better than many of us. Even though voluntary, without signing these agreements, people may not get the appointments or separation packages/benefits. In most cases most people do not like to talk bad of previous jobs and employers, so I guess most people sign these agreements. That being said, would you consider returning to the GSE’s once they are returned to shareholders and operating in a normal fashion? I understand as of now we do not know in what form the GSE’s may be released or what conditions they may be operating under as far a regulations go. Of course that would determine a lot for both employees and investors. I believe you actually care about this company and its shareholders and its importance to the people of America and investors worldwide. Thank you sincerely and best. Well, a lot would have to happen before that might come into question! There also is the matter that in April 2008, when Frank Raines and I settled the Notice of Charges OFHEO had issued against us, I agreed not to challenge a clause in the consent order Fannie Mae signed with the SEC and OFHEO in May of 2006, which said, “The Board agrees that Mr. Franklin Raines and Mr. Timothy Howard may not be engaged, employed, or otherwise provide services to Fannie Mae, whether for compensation or not, subsequent to the separation of these employees from Fannie Mae, unless otherwise required by law.” I assume this agreement is still binding, so that would be a problem. Why did you and Mr. Raines agree not to challenge the clause? Tim, Thank you for your excellent post. You gave words for Judge Sweeney that are entirely factual that shines sunlight on the dirty tricks. I hope all lawyers for Plaintiffs read your posts. I always reply that the lessons that I have learned researching and following this saga(Carnival) is worth the price of admission. Hopefully, the courts will not let any of it stand, including the original cookie jar accounting conservatorship. Though I have lost complete faith in my Government and elected officials, you have restored my faith in humanity by taking your time to share your knowledge and help fight for the truth. Thanks again for all of your work. Isn’t it really simple? If this is a conservator-ship, how could there be a mandate to reduce capital levels to zero by 2018? That’s what the lawsuits are about; FHFA hasn’t been acting like a conservator. When do you know if your amicus curaei will be accepted by the court. Defendant has filed a motion to deny your brief because of your previous position. Thanks for all the help to come out with the truth. The truth trumps the lies in the court of law. Scroll down a bit; I responded to your earlier version of this question at 11:02.
i enjoyed this particular write up immensely. and the fact that Berko just said that there WERE negotiations between Plaintiffs and Defendants in the Fairholme case in late December makes Lew look like the fool that he really is for lying for this administration. and the media who took the bait and reported it…. Very good write! Clearly an expert on issue which the courts should have excepted brief. Mr. Howard you are doing a great service to country and GSE Shareholders. I just pray we are not already a banana republic or no longer a land of laws we used to be. Soon enough we will learn if we still have a Constitution of value. Does HERA give Mel Watt as Director of FHFA the power to end the conservatorship without assistance from Congress? Would ending the conservatorship end the third amendment sweep? With his comments about the dwindling cash reserves, why do you think he doesn’t do something other than talk about this huge problem as if he isn’t in charge? I answered a version of this question in response to a (late) comment on my previous post. I’m not an expert in HERA, and wouldn’t want to opine as to whether Watt could end the conservatorship on his own. I do know that it would make no sense for him do to that with the Third Amendment sweep still in effect, and Watt can’t end the sweep without the concurrence of Treasury. And given that he can’t end the sweep himself, I thought it was useful for him to emphasize in his speech the vulnerability Fannie and Freddie have to unpredictable volatility in their GAAP accounting results in the absence of an adequate capital buffer. When do you know if your amicus curiae filed will be accepted by the court. The defendant has filed a motion to deny your brief based on your former position. Anyway thanks for all the truth on the takeover. Whatever happens we always believe in” truth trumps lies in the court of law”. I’m not sure of the exact timetable yet, but a decision on accepting my amicus in the Delaware case isn’t imminent. I do know that the firm that filed it is considering a response to the government’s motion to deny, and I expect to hear from them shortly as to whether, and if so when, they will submit a response. After that, we may get a better idea on the timing of a final decision on the matter. Todd: I don’t want to start making predictions. The outcome of the various legal cases will depend on the response of the judges (or a jury), but I believe the facts in both the net worth sweep cases and the challenge to the 2008 conservatorships strongly favor the plaintiffs. It’s also possible that, seeing this, the current or the next administration could elect to change the Third Amendment or the SPSAs (including voiding the warrants). This makes a whole lot of sense. Thanks for outlining the stages of their theft and for providing the facts on their historical earnings into context. Do you know why treasury chose 79.9% in warrants instead of a different amount? Yes. That amount, 79.9 percent, is the most Treasury could own before it would have to put the companies’ $5.0 trillion in debt obligations on the federal balance sheet.